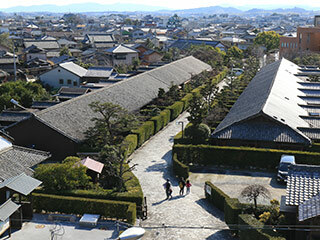 Matsuzaka Gojoban Samurai residence (旧松坂御城番長屋) is located in Matsuzaka, Mie Prefecture. It is a popular tourist spot in Matsuzaka. There are 20 elite samurai's houses to protect Matsuzaka Castle. These houses are constructed in 1863. There are parking and restroom at Matsuzaka Castle. 1. use JR Kansai Line to Kameyama Station. 2. use JR Kisei Line to Matsuzaka Station. Matsuzaka Gojoban Samurai residence is the house of the royal guards of Matsuzaka castle. 20 Samurai of Kisyu domain was chosen and lived in this residence. This house was constructed in 1863. One of the houses was lost but 19 houses are remaining in the original conditions. The storage was removed from Matsuzaka castle.